With content that is completely up to date and includes the latest discoveries and interpretations of prehistoric life, this is a comprehensive exploration of dinosaurs during their 180 million plus years of existence. My 8 year old daughter, Bridget, is very interested in learning about dinosaurs. She studied it in school last year and has watched just about every dinosaur movie out there multiple times. I figured she would be interested in reading Dinosaurs: A Visual Encyclopedia to expand her growing knowledge about her favourite creatures. 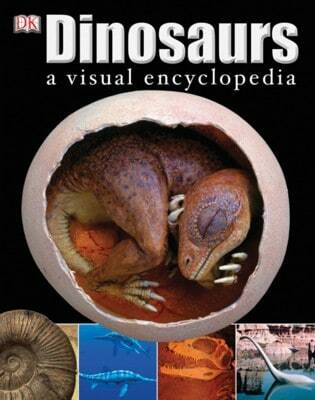 Dinosaurs: A Visual Encyclopedia is a huge resource with everything and anything dinosaurs. In fact, it even taught me a lot! It goes way past my basic knowledge, but explains the subject in ways that a child would easily understand and find interesting. There’s loads of pictures: illustrated and real photographs of fossils. It actually goes into more than just dinosaurs and shows other animals, insects, fish and reptiles that lived during the dinosaur age. The first chapter is about prehistoric life and evolution. It talks about natural selection and how animals evolved into what they are today. They show an example of an elephant and how it changed over 50 million years. I also found it interesting to learn about fossils and the various types that exist. The next couple chapters are about fish and insects. Then it’s Bridget’s favourite chapter the dinosaurs and birds. They tell you about each dinosaur including where they lived, when they lived, what they ate and more. I learned that there was a dinosaur called the Edmontosaurus which was named after the city, Edmonton in Alberta. Bridget was born in Edmonton so of course, she found that pretty neat that there was a dinosaur named after the city. It’s a plant eater (phew!) and twice as big a fire truck. In the mammals chapter, they talk about prehistoric cats. I’m cat crazed so I wanted to learn more about them. Some of them were pretty scary looking like the saber-toothed cat, the Smilodon. I also learned that cats and hyenas share a common ancestor. The first cats lived 35 millions years ago and have evolved into the cats we know today including the domestic house cats, lions and jaguars. Dinosaurs: A Visual Encyclopedia is an awesome resources for kids (and adults!). I even learned a thing or too. If your child is thirsting for more info about dinosaurs, this is the book to pick up to satisfy that need. This book is part of DK Publishing’s Back to School Boutique. You can save 30% on this book and other titles for a limited time! This so would’ve been great for me when I was younger-for school, and for fun! I’d loved dinosaurs since kindergarten-my fave was triceratops. I loved challenging myself with learning the spelling and pronounciation of all of the names. I found it funny I didn’t know what a velociraptor was until the movie Jurassic Park came out! Sounds like ths book would be a great read for any dinosaur fan. My nephew would love this, he is really into dinosaurs right now.Thank for the Christmas gift idea! This looks like a really cool book! My boys would love it! Looks and sounds like a great educational tool. My son loves Dinosaurs – I may have to get this book for him. Wow! Sounds like this is a good book to grow with and continue to learn. DK have such amazing facts and photos. Just looking at the cover draws your attention and interest. My grandson is seven and would love learning more. My granddaughter is younger, but I’m sure the photos would entertain her. I hadn’t heard about this book yet but will have to watch for it. This would be so neat to have we love dinos I am cat crazed too and would love to read that part of the book thanks for sharing this one. Ahh I need to get this for the 90s Me! I know little me would’ve loved it. I would have loved a book like this when I was a child. I think most kids go through some kind of dinosaur phase, and a book like this would be great to keep in the car so they can be entertained and learn. The pictures in the book look so cool. I know my nephew would enjoy reading and looking through this book. I have to send this link to my friend, her daughter loves dinosaurs! My son would love this book — he has been “into” dinosaurs for years. Thanks for your wonderful review! My nephew is dinosaur crazy, he may be getting this for his birthday! This sounds like a cool book. My nephew would love it. This seems like an amazing book! I think I might just order it and put it away to give my grandson with his Christmas gift, he loves dinosaurs! sounds like a cool book for dinosaur lovers! This looks like an excellent book – certainly a good addition to our homeschool library! My nephew just received this book as a gift on his 7th. birthday and he loves it. He is a huge dinosaur fan since studying them at school. I looked through the book and the pictures are awesome and the information is invaluable. I would give it the 2 thumbs up for sure. This sounds and looks like a good book one that the grandson would enjoy reading. Educational book for them too.